CoffeeCup Direct FTP is a dynamic piece of software that helps make the FTP process intuitive and easy. It's with you every step of the way - from making last-minute edits to previewing, organizing, and uploading your work, and then backing it up, just in case.Its functions: Edit Files From Your Server , Code Completion , FTP Activity Pane , FTP, SFTP, FTPS, and More , Combo Bookmarks , Browsing History , Vital Info at a Glance. This neatly ordered window makes complicated FTP logs a thing of the past, giving you a clear overview of the status of your file uploads and downloads. Direct FTP even lets you pause or cancel your file transfers. Direct FTP offers full-fledged local and remote file management, so you can add, move, and launch files all with a simple double-click. 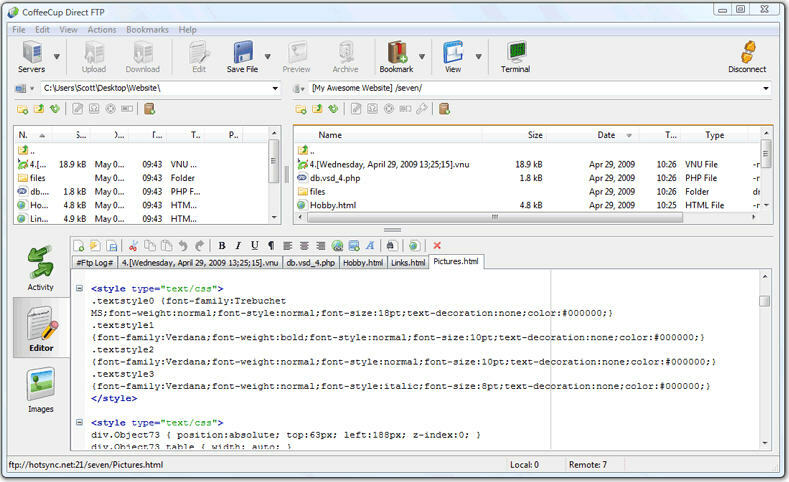 CoffeeCup Direct FTP is the only FTP software that incorporates a full-featured HTML editor. This means you can easily create, edit, or update a new Webpage, and then save the document locally, directly to your server, or both. Just drag a file to the Edit window to make changes. HTML code completion helps you make edits faster, and at the same time ensures that your code is clean. * Bookmark folders and go to them with just one click! * Edit HTML and Text right on the Server! The Only Drag and Drop FTP Client that Edits HTML, Previews Images and More! Direct mailer is a powerful tool to send e-mails in your opt-in mailing lists. Qweas is providing links to Direct FTP 6.9.1995 as a courtesy, and makes no representations regarding Direct FTP or any other applications or any information related thereto. Any questions, complaints or claims regarding this application Direct FTP 6.9.1995 must be directed to the appropriate software vendor. You may click the publisher link of Direct FTP on the top of this page to get more details about the vendor.